Alamoon Image Enhancer automatically enhances and improves color in your images. You don't need to know a thing about computers or photography to get great looking digital photos every time. 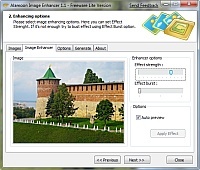 Alamoon Image Enhancer is a fully-automatic, hands free, one-click photo enhancer. You don't have to do a thing - you'll never need to read a manual, never need to open software and never even need to hit a button to make all your pictures look amazing. Alamoon Image Enhancer automatically enhances & improves color in your images. ...... You don't have to do a thing - you'll never need to read a manual, never need to open software and never even need to hit a button to make all your pictures look amazing. Alamoon Image Enhancer was inspired and developed to do one thing, to make your pictures look their absolute best. Do it quickly, affordably, and easily. Qweas is providing links to Alamoon Image Enhancer 2.2 as a courtesy, and makes no representations regarding Alamoon Image Enhancer or any other applications or any information related thereto. Any questions, complaints or claims regarding this application Alamoon Image Enhancer 2.2 must be directed to the appropriate software vendor. You may click the publisher link of Alamoon Image Enhancer on the top of this page to get more details about the vendor.